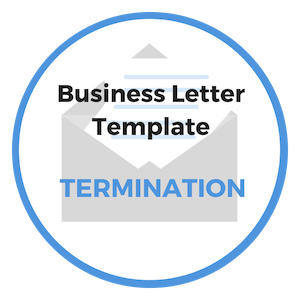 Our resignation letter template will assist you in notifying your employer that you have decided to resign your position and leave the company. Regardless of the circumstance involved in your decision, it's always best to try to leave on the best terms possible. To make that happen, both you and your employer have an important role to play. While you cannot control how your boss chooses to receive the news of your resignation, you do have control over how, when and where you communicate the message. Leaving a job can be an emotional and potentially volatile process. Too often a person will quit or resign their position out of anger or frustration about something they feel is unfair. Avoid making a decision to resign when emotions are high. It's better to make decisions when you are calm and thinking straight. A thoughtful response is always better than an emotional reaction. Ideally, you want to leave the job without burning any professional bridges. You never know when your past can once again play a part in your future. So, be careful and make smart choices in how you communicate - verbally and written. When writing a resignation letter, never use this opportunity to vent your frustrations or place blame on others. Be professional at all times. Accusing others for poor behavior will only be viewed as you as being unprofessional and lacking self-discipline. Besides, anything that has happened in the past is now water under the bridge and you've made the decision to leave so do it gracefully. "Always resign in person, with letter in hand. Be positive, polite and respectful." Whenever possible, offer to work through a certain date to help make the transition easier for your supervisor and teammates. While it's customary to give at minimum of 2 weeks notice, offering to stay on for 30 days to allow your employer time to identify your replacement will be considered a gesture of good will. Make every effort to leave your work space well clean and well organized for the person who will be taking on your duties. Not only with your replacement appreciate it, so will your employer - and you will also feel good about it. 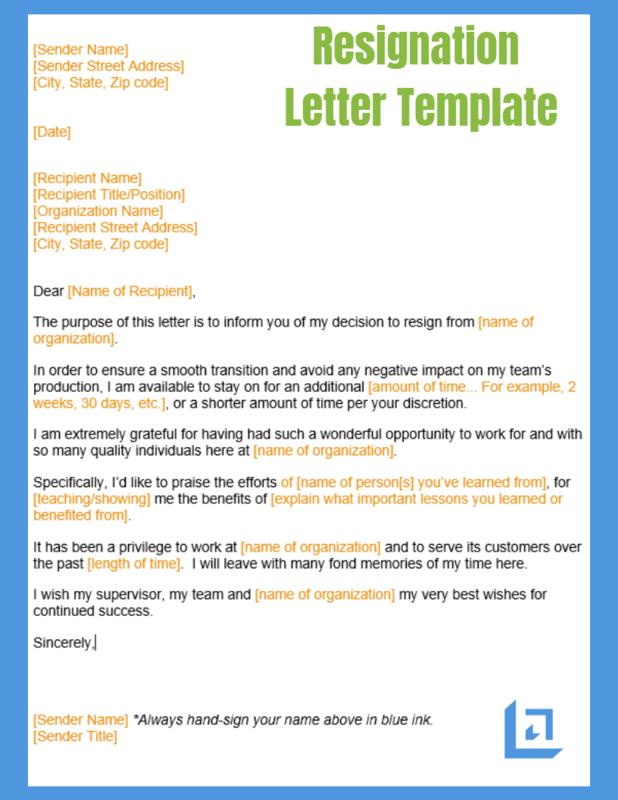 Using our resignation letter template will guide you on how to communication tough news in a professional and positive manner. "Be ready and able to resign. It will improve your value to the President and do wonders for your performance." Collect contact information. Your co-workers and business associates may wish to continue to network with you. These contacts may also play a helpful role in you acquiring a new position. Whenever possible, know where you are going before you quit your current job. Getting a job with another organization is easier when you are currently employed. It's easier to negotiate salary and benefit issues as well, so don't be in too much of a rush to quit. Be smart! Leave on good terms with your supervisor, team mates and business partners. Maintain good relationships whenever possible - life's just too short not to do this. Honor your employer and teammates. Include a statement about how much you appreciate the opportunity to work with such talented and professional people and how you will miss working with them. Only include honest statements, be genuine at all times. So if it's not true, don't say it. Note one or two key accomplishments. State how much you've learned from these experiences and thank them for the opportunity. Check spelling and grammar. 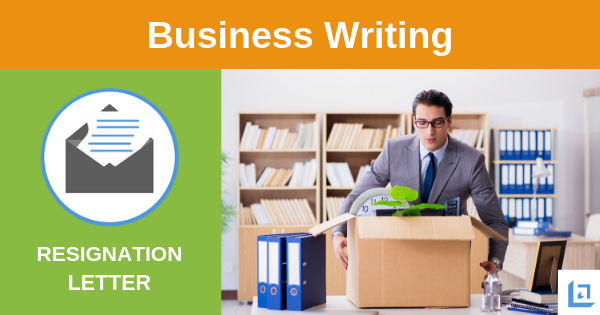 Make certain that your letter of resignation is free of any spelling or grammatical errors. Be certain you're making the right decision. After completing your resignation letter, set it down and walk away from it for at least 24 hours. Take time to digest your decision. Allow yourself time to wear this very important choice. Picture yourself without your current job. Do you have a clear plan for what comes next in your career? Choose time and place. Be thoughtful about where and when you communicate the news of your resignation. Ideally, schedule a meeting letting your boss know you have something important you need to share. Never put your supervisor on the spot by telling her in a public location. Allow for the opportunity to have a private conversation so you can share details if asked why you've made this important decision. Shown below is an image of our resignation letter template. Use this free template to communicate your plans to leave your current job without burning any professional bridges. Leave your position knowing that you've done everything possible to make the transition as smooth possible for all parties involved. Exit your current place of employment with no hard feelings. To download our free Business Writing Templates/eBook, complete with the above free resignation letter template, plus templates for several other topics, simply subscribe to our free newsletter. You will immediately receive a password that grants access to our entire leadership tools library.